Make selections and paint inside. Stage 1: Open File in Photoshop, Set up Layers, Delete Background, Fill with White. Find your image on the server. Drag your image to your desktop and place it into a folder with your name on it. You can create a folder by right clicking on your desktop. Title your folder with your name. Drag and drop is as easy as it gets. Start Photoshop and then choose Open and then navigate to your file. When you first open your picture you should see the Layers Panel at the bottom right corner of your screen. There will be one layer titled "Background" Double click on the word background to turn this into a Layer. Give this new layer a title such as "Picture." If you would like to crop your picture you can use the Crop Tool. Duplicate the Picture layer you just made by right clicking on the layer and selecting "Duplicate Layer." You can hide layers by clicking the Eyeball Icon on or off. You can also lock layers by clicking on a layer and then clicking on the Lock Icon at the top of the Layers panel. Lock and hide the bottom layer. 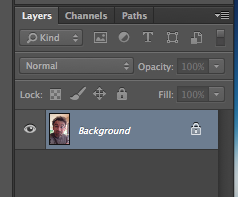 Create a new layer by clicking on the New Layer Icon at the bottom of the Layers Panel. Drag this new layer between your locked picture layer and the copy. Use the Quick Selection Tool to delete the background around your head. Select the top layer that contains your image. Find the Quick Selection Tool in the Tool Panel on the left side of your screen. You will need to hold down on the Magic Wand Tool to reveal the Quick Selection Tool if it is not visible. Click and drag a small amount to make a selection. Press delete on your keyboard to delete the selected area. Continue to delete small areas with out deleting parts of your face, clothes, or hair. If you select an area that is too large press Command-D to deselect. Delete the entire background. If you make an error you can UNDO by pressing Command-Z. If you don't see any change when you delete make sure that your bottom layer is turned off. Fill the empty Layer with solid white. 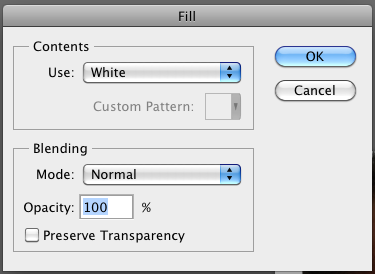 Select the blank layer in your Layers Panel. Select Edit-> Fill. Choose White. Click OK. Your project should look like this after you have successfully completed these steps! Click here to move to STAGE 2.